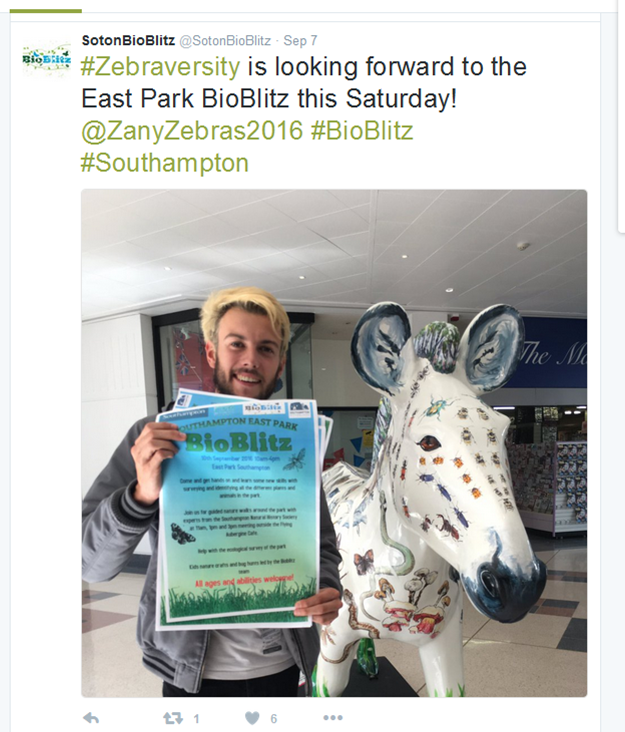 We're raising £3000 to buy our sponsored Marwell's zany zebra, Zebraversity. 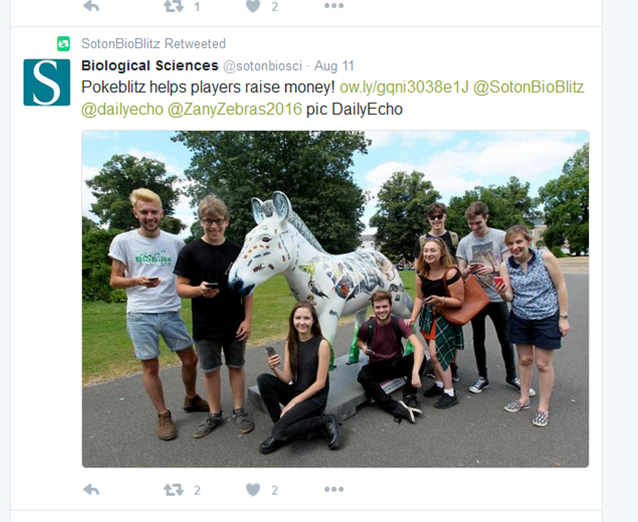 Throughout summer 2016 she has been the focus of the Southampton BioBlitz team's campaign to connect the people of Southampton with nature. During this time she has been visited by 1000s of people, quite a few of whom we have met at our weekly events. We chose for Zebraversity to be in a city centre park during the sculpture trail. Sadly she was vandalised and has now been moved inside, to the first floor of the Marlands shopping centre. We would like to buy her and release her into the beautiful Valley Gardens, on the University of Southampton's Highfield campus. We will continue to run events for the general public, based at our spectacular zebra. She is covered in paintings, by local artist Smock & Ballpaint, of endangered British wildlife, so is a good focal point for educational activities. 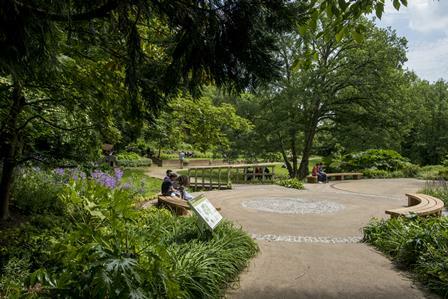 Our aim is to connect the people of Southampton with the nature around them. It would be a real shame if someone else bought her! Please help us to keep her! Zebraversity's new home in the Valley Gardens on the University of Southampton's Highfield Campus. As part of the BioBlits project this year, the team has been to visit schools across Hampshire and the South of England, leading bug hunts and other activities to help to engage school children with nature. We have also been busy working with local Cub, Scout and Brownies groups. These sessions were tailored to the groups' needs and the spaces available to them. We ran mini-BioBlitzes to help children develop their nature identification skills. 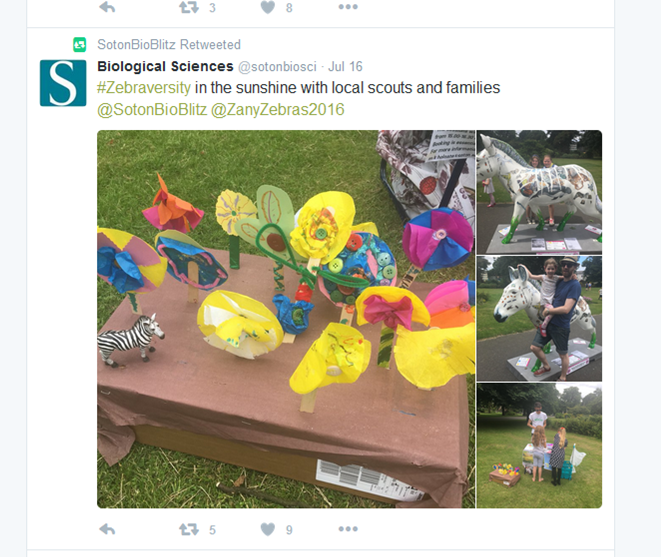 Throughout summer 2016, we have run weekly events at Zebraversity. These have varied greatly, encompassing lots of environmentally-themed activities, including Grassy hedgehogs (one of our favourites), bug hotels and making peg butterflies. We have interacted with hundreds of local children and their families. We also ran a BioBlitz in East Park, Southampton, including guided nature walks and the opportunity to chat to experts from Southampton Natural History Society. There were also nature trails around the park for families. Unfortunately it was a rainy day but we still found over 100 species! All of the sessions that we have run have been free of charge. By purchasing Zebraversity we will be able to keep running activities for the local community, using her as a focal point for events on campus. Due to the zebra sculptures being auctioned, we don't actually know how much money we need but we have based our estimate on the prices of rhino sculpture from a Southampton sculpture trail three years ago. Any funding above the final auction value will be spent on activities to engage the general public with nature e.g. mini BioBlitzes at local schools and scouting groups; nature-themed summer school; evening talks about nature. 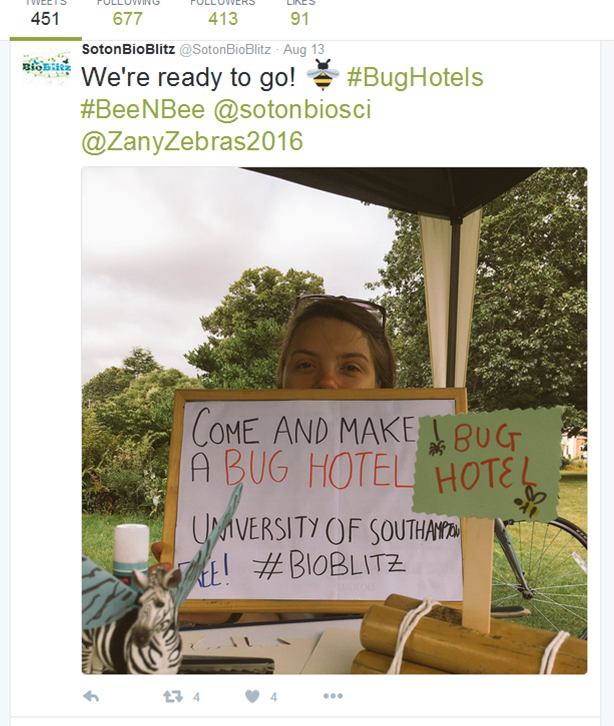 We will provide weekly updates on our progress on social media - Facebook (Southampton Bioblitz) and Twitter (@SotonBioBlitz). There will be rewards for all donators, from a social media shout-out, to an invitation to Zebraversity's release in Valley Gardens. Please donate to get your reward! All donations very welcome, even just £1. And, if you think others might find our project interesting, please share it with others via social media! A postcard of Zebraversity in her new home, in time for Christmas! Name one of the animals on the sculpture. First come, first served! Our hedgehog has already been named in a previous competition. He is called Rustle.